This is a pan we use daily in our kitchen. 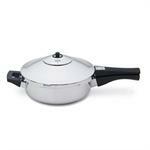 Kuhn Rikon’s “never oil” pressure fry pan is one of our top sellers in this line of cookware. It has an exclusive waffle weave bottom that allows for exceptional browning of meat without burning and without fat. It has an exclusive waffle weave bottom that allows for exceptional browning of meat without burning and without fat. Generous 5qt. capacity, big enough to handle the biggest family meals. 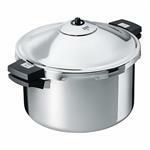 The Family/Hotel line of Pressure cookers are preferred by chef's and restaurants. The extra capacity of the 12 quart pressure cooker is big enough to cook an entire 20lb turkey or enough potatoes to feed a crowd. Beat the clock, beat the heat. 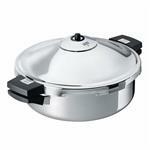 Kuhn Rikon Pressure Saucepans cook vegetables with a minimum amount of water preserving vitamins and nutrients. 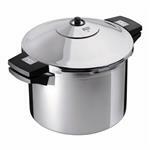 These pressure cookers are definitely a pan for all seasons, and a pan for all reasons. Beat the clock, beat the heat, beat the fat. With an automatic lid locking system and 5 built-in safety features they simply cannot “blow up” – these are not your grandmother’s pressure pan. 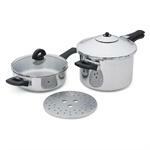 The ultimate cookware – made in Switzerland. A perfect starter set that includes a 2 qt. frying pan, 5 qt. 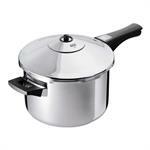 saucepan, pressure cooker lid and a glass lid.